Yes indeed and I knew that would be the case. The fact that the trees had also lost most of their leaves (my Ash trees had no leaves left) was a factor too. Actually its not as simple as that. Trees and hedges also provide shelter for ESB poles. Exposed poles often come down in bad storms. 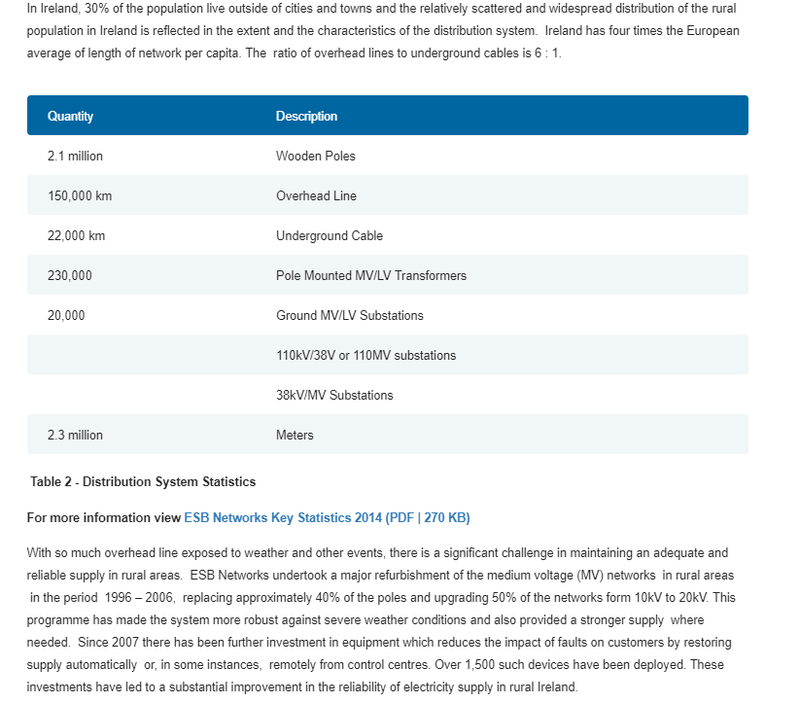 Correct, the faults in Galway during Ali were much often more labour intensive involving tree cutting, tree moving, new poles, new transformers, new cablingand reconnections. Not to mention traffic control and safety procedures. Very messy with several roles involved and lots of incidents to prioritize. I saw power lines down with no fallen tree involvement yesterday. I also saw trees and branches down from strong gusts during the night. Re Galway and Ali - from the ESB outage map for Callum most of the faults were in the south of the country. Last edited by gozunda; 13-10-2018 at 13:48. Well now you are a book of knowledge well done on your insightful post. Top marks. The reality is kid that if powerlines are coming apart because of wind speeds that are softer than that out of the cheeks of my ars* then we don't stand a chance if we had a proper storm. Last edited by Amprodude; 13-10-2018 at 17:26. I don't know if you have eproctophilia or have a gastric issue but you seem to go on about your farting quite a bit which you might want to get looked at by a professional. don't bore me with esb jargon that 95% of people haven't a clue what you are talking about. They aren't doing enough to reduce power failures. In 2014 we were 2 weeks without power. IF you think that's acceptable then you are a nothing but a foolish person. and yes my wind would cause more destruction the what Storm Callum would have done and I'm proud of that thank you very much. Random punter :: "nobody died during callum. Met eireann are stupid. I didn't see a thing"
The data is very straightforward, I'm sure more than 5% understand it. It's important to realise that just because you do not understand something, that does not mean that nobody (or even 95%) are not capable of it. Please go fart against a telegraph pole and see what happens. As soon as your farts have succeeded in bringing one down, your bowel problems become relevent to the topic. I suspect at least 95% of people in the discussion don't feel they have cause to be concerned about Storm Amprodude any time soon. Well esb faults arent nearly as frequent now as they were when we built our house. They were common any wind or snow storm. Maybe they're not perfect, but it's a nonsense to suggest that things haven't improved. I'd say people are just more "entitled". We saw the same last winter - mid snow storm giving out about roads not being cleared, when back in the 80's storms the village was cut off for more than a week. Realistic expectations have gone for many of the population. it's not that hard to understand but I think 95% of people don't want needless power data. You are very funny, did you ever consider going into full time comedy with your wind? Mod Note: Amprodude read the forum charter before posting here again. Please desist from your style of posting which has nothing to offer the forum but only serves to rise others into an argument which in turn lowers the conversation and brings the thread off topic. The Mod team will take appropriate action if the forum charter is not adhered to. I think your one of the 5% that doesn't understand it. It's pretty straight forward. So Its been four or five year since you didn't have power for two weeks. I think that is pretty good to be fair. Do you think billions is going to spent to improve power resilience across the country just so you don't lose two weeks power every five years when a bad storm hits. Irelands weather isn't bad enough. Do you know that 1+1=2?